This Chess Board - Tea Table Is Good for any home. Brings in the Fun While having Tea. Chair Size: 41 In. (H). Table Size: 25-1/2 x 25-1/2 x 28-1/2 In. (H). This Chess Board - Tea Table Is Good for any home. Brings in the Fun While having Tea. 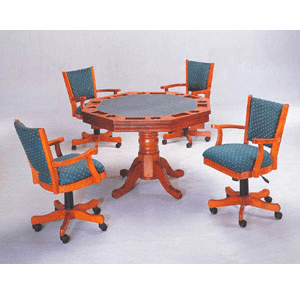 Table Size: 33-1/4 x 33-1/4 x 26-1/2 In. (H). Arm Chair Size: 40 In. (H).